Weave without spending a fortune! 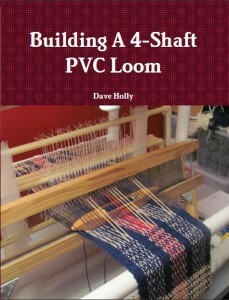 Buy the book and build your own 4-Shaft PVC Loom. Buy the Book Here . . .
New Milestone Reached Today – 1,000 copies of Building a 4-Shaft PVC Loom have been sold! Jim H on My Humble Booth at the GSSB Fiber Show! Dave on My Humble Booth at the GSSB Fiber Show!